Life is about new experiences and for many people that means travel. Me, I travel on my stomach. All of my vacations are rigorously planned around trying new restaurants, wineries, cocktail bars, farmers markets, and specialty food stores. In Spring 2012, I was in the process of planning a summer trip to Napa Valley and had come across an online article in the Vancouver Sun about a company called Into the Vineyard that piqued my curiosity. Into the Vineyard is an independently owned and operated company in Vancouver that specializes in creating customized wine travel experiences in all of the major wine regions of the world. Much of their clientele are well-off individuals who lead busy lives and don’t have time to research and plan vacations but who want a unique and personal experience based around wine. They seek out and partner with local tour companies in each region who have deep relationships with people in the wine industry and are able to take their guests to places that are not normally available to the public. Even if you could walk up to the gates of Chateau Margaux, gaining entry is a different matter entirely. Some of the wineries are accessible to the public but the tour companies are able to arrange time with people and access areas that normally would be unavailable. 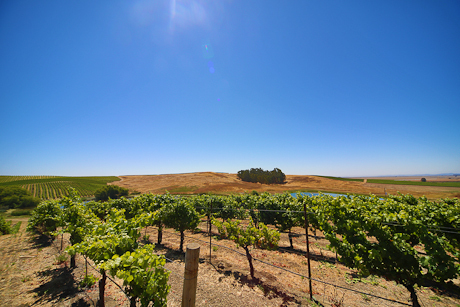 In conjunction with their network of contacts in the tourism industry, Into the Vineyard can arrange for day tours that only include wineries or multi week affairs that incorporate sightseeing, luxury accommodations, bike tours, hot air balloon rides, and many other ways to immerse yourself into the locality of interest. My curiosity piqued, I contacted Into the Vineyard to get a better idea of what they might be able to offer for my summer trip. The process of booking with them was different from the norm where you buy ‘off-the-shelf’ packages, flights, hotels, tours, etc. It’s more akin to going to a restaurant, talking to the chef and sommelier about your likes, dislikes and tastes, and allowing them the freedom to design something just for you. When I first contacted them about their services, they asked me a number of questions about what geographic area I wanted to explore (Napa), potential wineries that I was interested in visiting, budget, tour duration, and the types of wine experiences I was looking for. Beyond the informal questionnaire, they also do their own research on potential clients and discovered that I was a Foodist. As a result, my husband and I were invited by their most well connected partner in California, Viviani, to do a few days of touring. Viviani provides customized luxury vacation packages for those travelling to the west coast and is Into the Vineyard’s contact for tours and events in states of Washington, Oregon and California. It was started by Linda Viviani over 30 years ago when a conversation with her mentor, Robert Mondavi, led to the idea of filling a hospitality gap for a certain breed of wine enthusiast. Her business has since grown encompass a wider range of offerings. For those who want more than just wine and food to round out their days, her company can also arrange for hang gliding, racetrack driving, boating, plane rides, skydiving and more. When choosing where to put your vacation dollars, the value equation can run the gamut from a bargain basement package to the best that money can buy. A Foodist analogy might be from a humble bowl of congee all the way up to a three Michelin star meal. I’m lucky enough to have tried both ends of the spectrum and much in between, and while a meal at a world class restaurant isn’t for the everyday (or even every year), it’s within the realm of possibility if the desire is there. Since we had already gone to many wineries on our own on past trips, we were curious to see what a premium guided tour would be like so decided to place ourselves in Viviani’s hands for one day. All of the arrangements were made through Into the Vineyard and I was presented with a itinerary proposal prior to the final booking. In my prior conversations with them, I hadn’t specified any particular wineries that I wanted to visit but I did mention favourite wine styles, producers, and the types of places that we’d visited before. Our itinerary included a guide/driver with a luxury vehicle, lunch, and stops at four wineries in Napa and Sonoma. Our trip took place at the beginning of July and, in addition to the day of guided touring, I’d also researched many wineries to visit on our own. The guided tour day was scheduled for our last full day in California. 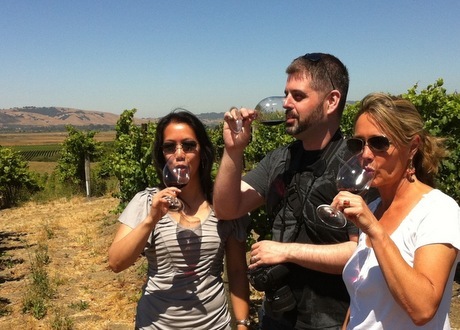 On our own, we managed to cover eleven wineries, tasting rooms and/or tours. These visits ranged from superficial and touristy to relaxed and slower tastings, from less than hospitable service to fun conversations, by ourselves or with tourist groups, and a few more thrown in for good measure. By the time our guided tour day came around, I was pretty eager to see how it would be different from our own days. My first surprise was when our guide introduced herself and it was none other than Linda Viviani. As we drove to our first destination and we got to talking, I knew that this day was going to be something new. Linda has lived in Sonoma for over 30 years and has directly been involved in the growth and evolution of the California wine industry. I really got the sense that she was connected to everyone. The tour guides that she employs also tend to be locals who have lived in the area and have been immersed in the industry for many years. She had a great depth of knowledge of the area, the people, and many other things that weren’t necessarily related to wine. While driving between wineries, she told us about interesting places in the area, her favourite restaurants and the best ways for a stranger to experience her home as a local would. Though her company caters to a variety of clientele, her personal passion remains making connections between her favourite wineries and wine enthusiasts. The selection of wineries is based on what she and her staff feel will be the best fit. They won’t recommend a winery unless they think it will be a good fit, and that includes choosing wineries in an appropriate price range. However, if you want to taste nothing but 100 point wines they can make the arrangements, but that would be based on someone else’s palate and not necessarily be the best match for you. The next thing that I noticed was the slower and more relaxed pacing, and it was interesting to feel the difference from our faster self-guided days. The first place that Linda took us to was the Donum Estate in Sonoma. The only California wine region that I’ve explored previous to that was Napa Valley. I’ve heard people describe Napa as being the Disney of the wine industry with its carefully maintained buildings, well manicured plots, popularity with tourists, traffic bottlenecks, and higher price tag. As we entered Sonoma wine country, I noticed its quiet ruralness and liked it immediately. There were rows of vines for miles and miles, and then the mountains beyond them. It was a very peaceful place to be. We drove down a gravel road into the estate and were graciously met by Anne Moller-Racke, Donum’s president and winegrower, and Brooke Gadke, their hospitality director. Anne and Linda have known each other for many years and greeted each other as longtime friends. Donum isn’t open to the public for tastings so we had a private tasting under the open sky, surrounded on all sides by Donum’s rolling fields. Anne spoke about her background and winemaking approach while Brooke introduced their wines to us. Anne has been farming Donum’s lands since the late 80s and inspired by Burgundy, her goal is to produce the best estate grown Pinot Noir and Chardonnay possible. From her German farming heritage, she believes that great wine starts in the vineyard and that means constantly working the fields. 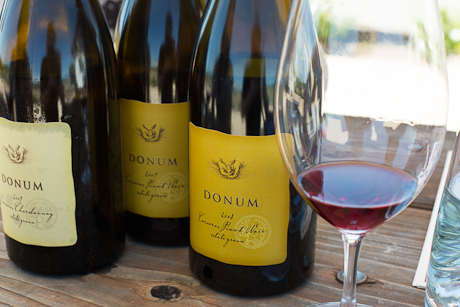 Appropriately, Donum’s bottles have “The gift of the land” inscribed on the foil and their label shows a pair of hands cupped together holding a small pile of soil. I’m by no means an expert on Burgundy and this isn’t a tasting-centric post (there’s the rest of the Internet for that), but I was enamoured with the character of the wines and willingly seduced by the setting. Instead of a nameless employee pouring wines and repeating a well rehearsed script, we were having an engaging conversation with the person who has the greatest influence of what goes into each bottle. One of my favourite memories from the day was of Anne casually emptying her glass of premium wine onto the ground for the next pour. It was a beautiful and fitting gesture. I think wine is too often an overly serious subject. We also took a quick walk through the vineyard up to a newly built terrace on a hill overlooking the fields and it had a great view of the source of my favourite wine of theirs, the West Slope Pinot Noir. On the walk back down, I spoke with Brooke about one of my favourite subjects – restaurants. Wine country and culinary tourism go hand in hand and it was great to get her local perspective on some of my favourite restaurants in the area. There’s only so much that research can tell you and nothing beats the opinion of someone who has experienced it firsthand. As I would come to observe at each of our stops, our time at Donum passed all too quickly and I understood why Into the Vineyard recommends a small number of wineries per day; I could easily have stayed at Donum for hours. 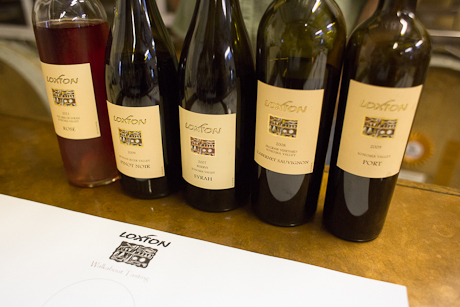 The second stop was Loxton Cellars, also in Sonoma, and we were introduced to winemaker and owner Chris Loxton. Chris has a Ph.D. in Physics but he was incredibly easy going and one of the most down to earth wine people I’ve ever met. He practically gave all the credit for his wines to Mother Nature and her grapes. Loxton Cellars doesn’t own its own vineyards but Chris sources grapes from small growers that are able to meet his exacting farming standards. Even though he has a very scientific background, he prefers to get into the vineyards and see firsthand how the grapes are doing. He believes in growing great grapes and letting the wines express the quality and character of the grapes. His approach seems to involve setting up initial conditions as best he can, and then waiting and trusting in the outcome. My husband and I have engineering and physics backgrounds respectively so it was fascinating to see how someone who went even further in academia approaches the very natural process of making wine. At its simplest, the equation is just grapes plus yeast equals wine. There’s a great deal of impersonal science in modern winemaking, but Chris seems to have gone back to some of the basics of human senses rather than letting it all be about the measurements. Microclimate variation and adjusting for it are extremely important to him and he was able to illustrate this point by showing us the few acres that surround his winemaking facilities. Between the soil, sun-facing direction, sun and wind exposure, there were noticeable variations in growing conditions over the span of a few yards. Chris originates from Australia where his family has been growing wine grapes for generations. At Loxton Cellars, he makes Chardonnay, Pinot Noir, Zinfandel, and Cabernet Sauvignon but specializes in premium Syrah wines. There are multiple offerings of Syrahs, including a Port-style Syrah that pairs beautifully with chocolate. Loxton Cellars is open to the public and sometimes Chris takes people on a “Walkabout with the Winemaker” tour. We had to be on our way to our winery lunch stop so there wasn’t time but I would definitely come back for it. Lookout Ridge is situated near the top of the Mayacamas mountains that divides the Sonoma and Napa regions. Perched at the top of an extremely steep hill, the panoramic view from it was truly breathtaking. The vineyards were planted all along the steep hill face below the estate buildings and it was incredible to think of the amount of care and commitment required to tend the vines. I’ve seen pictures of steep vineyards overlooking Germany’s famous Mosel River Valley and I imagine being there would be similar to what I felt standing at the summit of Lookout Ridge. No picture could do it justice. The winery was founded in 1988 by Gordon Holmes who had a successful career in finance and Wall Street but now focuses his considerable energies and contacts on philanthropic projects. We were also joined for lunch by one of Linda’s tour guides, Marilyn Webster. Marilyn has worked for Linda for over 12 years and she accompanied us for the remainder of the day. While we had a relaxing lunch on the patio with some of his wines, Gordon told us how he came to start his Wines for Wheelchairs program after his wife was diagnosed with multiple sclerosis. As the disease progressed and she required the use of a wheelchair, Gordon saw firsthand how much people take their mobility for granted until it is no longer available to them. Realizing that there are many people in third world countries who don’t have the means to even purchase a wheelchair, he started his Wines for Wheelchairs program where each bottle of wine purchased is guaranteed to provide one wheelchair to a person who needs it. In first world countries, people usually need a wheelchair due to a medical condition but in many places of the world, war, unsafe working conditions, disease and poverty all contribute. Gordon has also partnered with some of the top winemakers in California to produce his wines, and each of them has donated their time to Wines for Wheelchairs. 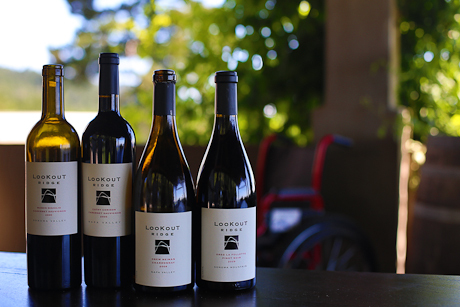 Currently, Lookout Ridge wines by Cathy Corison, Drew Neiman, Greg LaFollette, and Marcus DiGiulio are available and the name of each winemaker is prominently displayed on the label that they had a hand in making. Wines for Wheelchairs is just one of his ongoing projects and Gordon spends much of his time traveling to less fortunate parts of the world trying to match efficient solutions to those who need them. Lookout Ridge is not accessible to the public and it was a real privilege to visit this place and meet Gordon. Even Marilyn had not been here before. After lunch, we drove down the other side of Mayacamas to our last stop of the day, Palmaz Vineyards in Napa. Along the way, Marilyn pointed out a few of her personal favourite places in the area and shared some of her own experiences of wine country. There are so many interesting little stories that give a place more character and depth, and you wouldn’t be able to easily discover these on your own. This was another pleasant surprise to spending a day with two professional guides. As we drove up the Palmaz driveway, the main building came into view and it was impressive not only for its size but for the beauty of its architecture and the backdrop of estate grown vines. We were met by Amalia Palmaz, the wife of the husband and wife team who purchased the property in 1997 and made the winery what it is today. Amalia was an extremely gracious host and it was wonderful to learn about the winery from one of the people that started it and who is still hard at work there today. Palmaz Vineyards is the result of a family’s long labour of love and was built to its current state over many years. The winery site was originally known as Cedar Knoll back in 1881 and it is one of the oldest sites in Napa Valley. Its early history was quite successful but Prohibition was not kind and it sat derelict and forgotten for almost eighty years until it was purchased by Julio and Amalia Palmaz. Julio Palmaz is actually Dr. Palmaz and is famous for inventing the coronary stent that bears his name. The Palmaz family believe that a gentle winemaking processing makes complex and elegant wines, and that gravity-flow is the most gentle process. This involves the grapes starting at a certain height and each step in the winemaking process is located below the previous step, and the wine moves from step to step by gravity alone. It’s a centuries old winemaking technique and it was used in the very early days of the California wine industry. 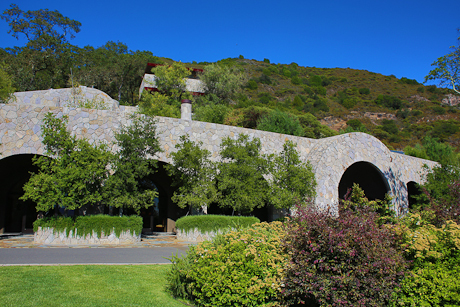 (The Culinary Institute of America’s historic Greystone campus in St Helena was originally a gravity flow winemaking facility.) No pump is ever used in Palmaz’s entire winemaking process. In order to achieve this goal, they had to build a facility that is 18 stories high, or 180 feet. Over 80 feet of this alone is needed to filter the wine by gravity since you need that much height in order for a column of wine to create the necessary pressure. It’s an extremely labour intensive method but the Palmaz family believes that it makes better wines and is worth the effort. Even though the process is a very traditional one, the facility is entirely modern. The most impressive example of this is the room where their fermentation tanks are located. The property is divided into 24 parcels of land and the wine from each parcel is fermented separately from the others. After the grapes are harvested (this is done at night by the way, so that the grapes are cooler and closer to the temperature of the winemaking cave), they are hand sorted and crushed, and the grape juice flows through a trapdoor and down into one of the waiting tanks below. The tanks are all sitting on a custom designed carousel that rotates the filled tank away from the trapdoor and moves the next one into place, ready for the grape juice from the next parcel of land. 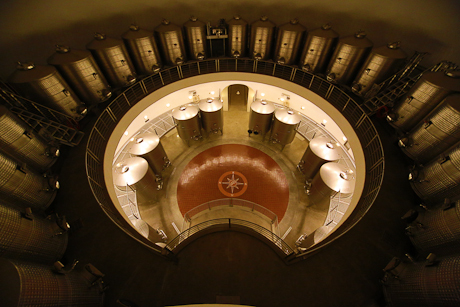 While the grape juice is in the tanks, the fermentation process is entirely computer controlled. They’re able to dial in a ‘fermentation profile’ of brix versus time and the computer will adjust the conditions so that the wine ferments according to the pre-set profile. It’s an awesome place to see and I felt like I was in a movie set. (Palmaz Vineyards has actually been used as a filming location.) Three of the family members (Julio, son Christian and daughter Florencia) have scientific backgrounds and they’ve had a direct hand in designing many aspects of their modern facility. After the wines have been tank fermented, it’s time for them to be blended. The decision of how and what to blend is done by Amalia, her two daughters (Florencia and Jessica), and two other winemakers, all of them women. Each person has blind samples of the wine from each tank and will independently decide on which and how much of each sample will make the best blended wine. Then as a group, then will try each other’s blended samples and refine and discuss and re-blend until everyone has agreed on which blend is the best. Sometimes the process can take weeks but this family doesn’t believe in cutting corners. Once the final blend has been decided on, the ‘recipe’ is entered into a computer and wines in the tanks are blended together via a vacuum chamber method. Palmaz offers private tours and tastings by appointment only and all tours are conducted by one of the family members. It’s the most interesting winemaking facility that I’ve ever seen and I would recommend making a visit for any wine connoisseur. Our last stop on the Palmaz tour was the tasting room and Amalia took us through a private tasting of five wines paired with delicately prepared canapes. From the first sip, the texture of their wines was noticeably different. These were some of the softest and most elegant wines that I’ve ever had. The nose and taste were also beautiful (as expected) but the softness really stood out, even in their Cabernet Sauvignons. It was amazing to see how well the family’s vision for wine actually translated through to the end product. Even though this is a prestigious winery, Palmaz Vineyards is very family oriented and their wines are named after members of the family. Amalia has led a remarkable life and as we tasted through the wines, she shared some of her personal stories with us. We lingered for a long while enjoying the wines and conversation, and we lost track of time and ended up staying longer than scheduled but that was the perfect way to end our day. Much of the process in making great wines is labour intensive and it also requires the patience to let things run their natural course. As a consumer of wine, it’s easy to forget that these wonderful products on shelves, in cellars, on dining room tables and poured into glasses are the result of the hard work of real people. I got to know some of these people, what they’re working towards, and see that reflected in their wines. They focus their energies on quality over quantity, and all of them believed in older vines, lower yields, smaller grapes, and that stressed vines produces better wines. They were honest, open, warm, gracious, and very proud to share their wines and stories with us. The feeling was more akin to comfortably talking in a friend’s living room and relaxing with a few glasses of wine, except that the wine happens to be fine house made wines and the metaphorical living rooms are extraordinary. After our tour, I re-read the initial proposal from Into the Vineyard. As far as the times, places, and people, our day went pretty much as the itinerary described. In reality, it was so much richer than the facts listed on the page. When I first met her, Linda mentioned that her role is in building relationships with people and creating experiences to match accordingly. I thought she did a great job of choosing places to match our tastes and preferences. People pairing if you will. It’s easy to find great wines in Napa but it’s harder to find the kind of deep personal experience that leaves a lasting impression. As my husband succinctly put it, “it wasn’t what I expected, it was better”. At some point, I hope to be able to explore the regions of some of my other favourite wines. German Rieslings. French Bordeauxs. Alsatian Gewurztraminers. I also intend to return to Northern California wine country in the future as it’s fast become my favourite destination. After that memorable day, I would have no reservations approaching Into the Vineyard again to create a wine experience through Viviani. Until then, my husband and I have a few beautiful bottles from each winery cellared away and some great memories.